Today you turn five. This past year you graciously gave up your position of being the baby of the family. Little ones have come in and out of our home and for the most part you’ve done well with sharing. Sharing your room, your toys, your sisters, your daddy and your mommy. Since you were born you have been the center of attention. We probably definitely are guilty of over indulging you at many points. So it has been very neat to watch you become less self-centered and more others centered. You have become more aware of how you can serve and be helpful, not only to the smaller children but to the rest of us as well. You also have grown in your independence. Which is a relief because I thought you might end up taking Ryann and Micaila to college or something. 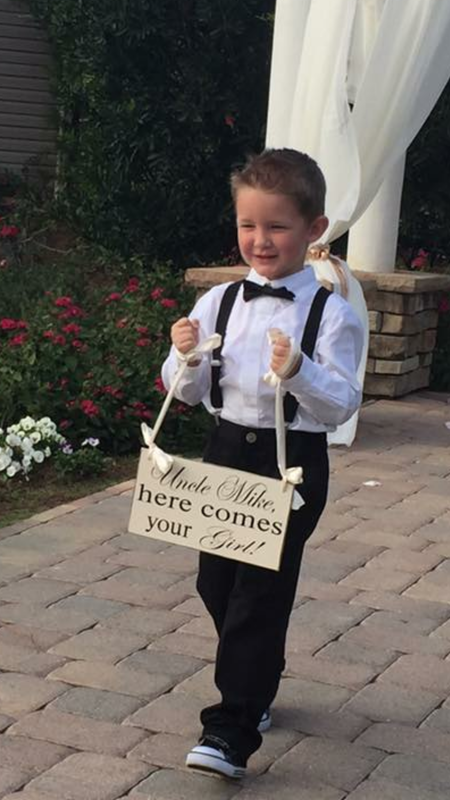 In March it was your responsibility to be the sign bearer at Uncle Michael and Aunt Jessica’s wedding. You had to walk the aisle alone. Rarely do you ever do anything apart from me or your sisters but you owned this role and executed it with perfection. This past year you also experimented with lying. This resulted in loss of privilege playing the playstation. Which is like dying for you because you are a serious gamer. Indeed you are becoming familiar with good and bad choices, consequences, and most importantly confession. I pray your daddy and I can lead you in the path of true repentance, pointing you to the One Who paid the penalty for our sin, and that in Him you will find life, freedom and joy. Caleb you are still all boy. All super heros, all fight, all wrestle, all dirt and noise and big, loud trucks. You are fascinated with Luke Skywalker and love running around in your halloween costume fighting the Dark Side. When Daddy comes home from work you immediately go into wrestling mode. You maaaay need to work on your receiving of punches or water squirting or nerf dart shooting but you sure love dishing it out. You have a sharp mind, Caleb. By memory you counted every day for 14 days how long we had till it was time to go to the beach. Without a calendar! Maybe I’m easily impresed but I can hardly keep my days straight! You remember things from years past that I have a hard time recalling. Like getting your finger stuck in the door at church when you were 3 or that bad storm at the beach last year or that time Jesus held you when you were a baby…..????? Not sure where that last memory came from but you seem to enjoy recalling it. You came home from VBS quoting the scripture and songs you learned. You LOVED VBS. That made my heart so full. And speaking of songs you are much like your sister, Ryann, and are always singing. Never stop making that joyful noise to the Lord buddy. This coming school year we have decided to enroll you at a private Christian school. I’m so excited for you to experience learning outside of our home, making new friends and adoring your teacher. I think you are going to love it and grow in so many areas as we explore a new territory. And of course I’ll likely cry because you are growing way too fast. But growth and the passing of time with you are things I’m so thankful for. I’m grateful God has entrusted you to us and for every single second we have with you. One of my favorite prayers is Psalm 119:33-37. I pray it’ll be your prayer throughout your life.